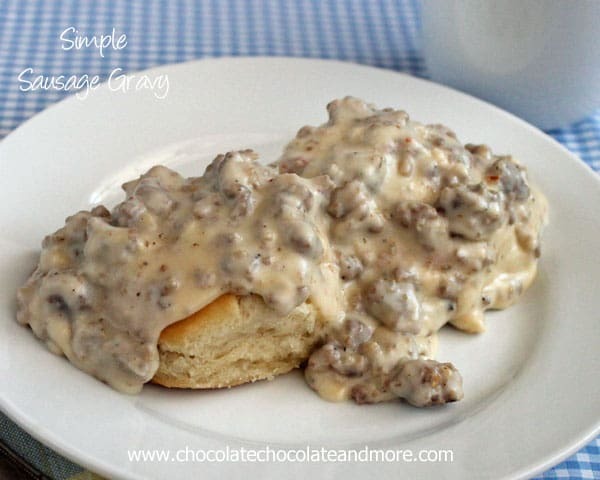 Homemade Biscuit Mix - Chocolate Chocolate and More! 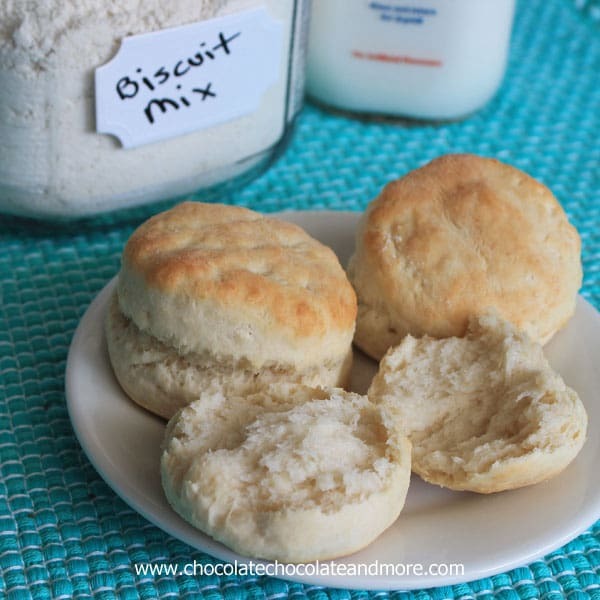 Homemade Biscuit Mix-you never have to buy the box stuff again! I’ve mentioned it a zillion times. My mom didn’t cook so we grew up with Bisquick biscuits, Bisquick pancakes, waffles, dumplings, you get the idea. I keep a big box in the pantry and I’m not ashamed to use it. Buying box mix is never cheaper than making it yourself. Not to mention it’s fresher. No preservatives and all that. So I did a little research. All the recipes were pretty much the same. Flour, baking powder, salt. They either used vegetable shortening or butter. I went with shortening for 2 reasons. First, if you use butter, you have to keep your mix refrigerated. I don’t have room in my fridge for anything extra. Second, I have these memories of Aunt Barbara making the best buttermilk biscuits in the world, from scratch. She used shortening. Then there was the issue of sugar. Some had it, some didn’t. So I went to my big box in the pantry and looked at the ingredients. Yup, right there in big print-Dextrose. Dextrose is a form of sugar. So I went with the sugar version. 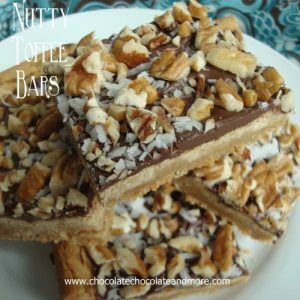 I used the recipe I found over at It’s Yummi . This mix took me less than 2 minutes to make a quadruple batch. And that was using a pastry blender. No need to drag out the food processor if you don’t want to. Of course I had to test the mix. These biscuits may just be the best biscuits I’ve ever had. They doubled in height and were so soft and flaky on the inside. Melt in your mouth good. In a large bowl, combine flour, baking powder, salt and sugar. Cut in shortening with a pastry blender until well combined. Mixture will look like cornmeal. Store in an airtight container for up to 4 months. 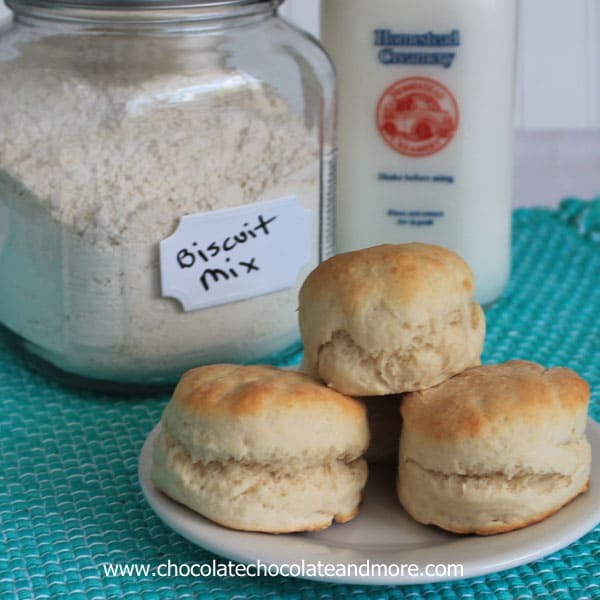 Combine biscuit mix and buttermilk in a mixing bowl until the mix is completely moistened. Turn dough out onto a floured surface and knead it 4-5 times. Roll dough out to a 3/4 inch thickness and cut with a biscuit cutter. Place cut biscuits onto a lightly greased baking sheet. Bake in a preheated 450 degree oven for 9-10 minutes, until tops are lightly browned. double, triple or quadruple the recipe to have enough on hand whenever you want to make biscuits. What a great recipe! I love Becca over at It’s Yummi too! My hubs loves biscuits, but I am always wary of boxed mixes, so this is perfecto! Pinning! I lovelovelove biscuits! I’ve never put sugar in them, but maybe I’ll try it in my next batch for research purposes. so smart!!! 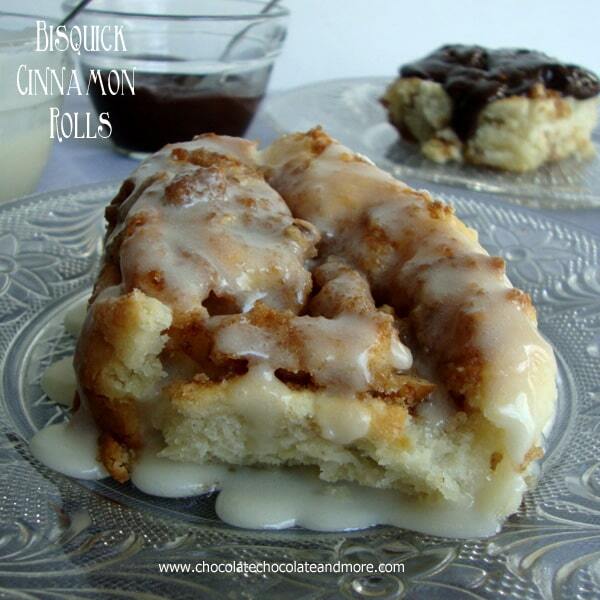 Love how you’ve recreated the boxed mix into a from-scratch version! I haven’t tried shortening, so I can keep it in the pantry. In Australia these are called scones. Often cooked using pumpkin as well, Yum! Thanks for the batch recipe. How would it work with lard? Will it keep as well? 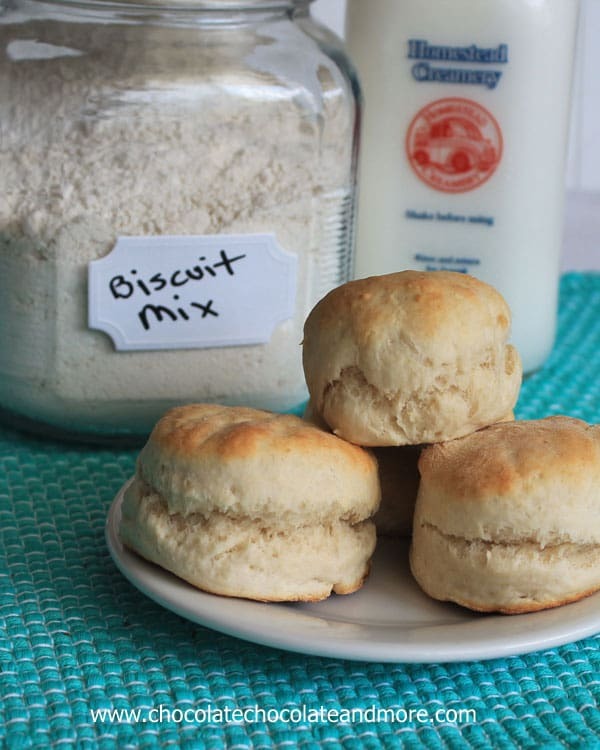 Yes you can use lard as a substitution and as long as your lard doesn’t need to be refrigerated, then the biscuit mix doesn’t need to be refrigerated. Where did you get that super-cool jar?! Love it! I found the jar at Walmart. They had all sizes last time I was there. The recipe calls for 1 cup biscuit mix and 1/3 cup milk but above that I saw that 2 1/2 cups of mix yields 4 biscuits. Would that mean you need 3/4 cup milk for 2 1/2 cups mix? 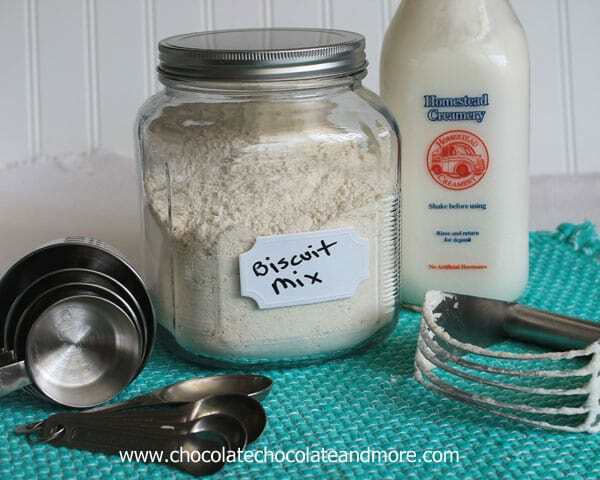 Yes, the biscuit mix recipe will yield 2 1/2 cups of mix. Most people will double or triple the mix recipe to have on hand in the pantry for other projects instead of making the mix each time it’s needed. For the biscuit recipe, you can make as few as 4 biscuits or you can double, tripe, etc for what you need to yield. 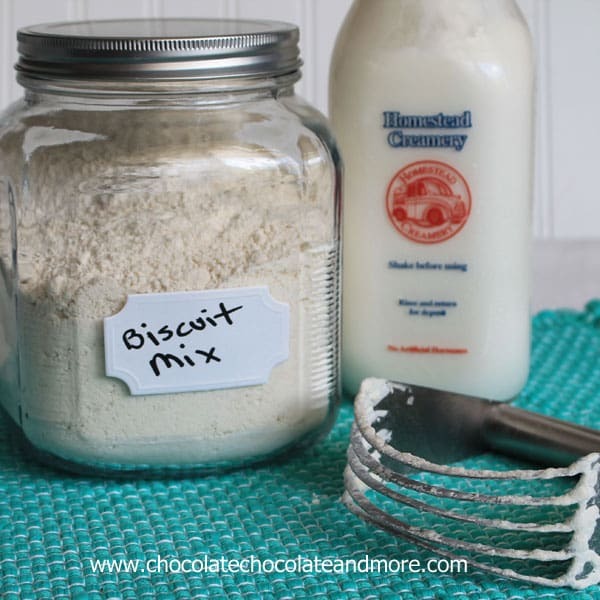 If you wanted to just make one batch of mix and use it all for biscuits than yes, 2 1/2 cups of the biscuit mix and 3/4 cup of milk would be the recipe. Can you make pancakes with this mix as well?? Yes you can. To make pancakes use 2 cups of biscuit mix, 1 cup milk and 2 eggs. I made these today but they didn’t rise much. Could I add soda to make lighter? Was your baking powder fresh? That can make a huge difference in your rise. What kind of vegetable shortening do you use? Crisco or liquid oil? I use the solid Crisco shortening. Can butter be used in place of shortening if I make the biscuits right away?? Yes you can substitute butter for the shortening. Hi! 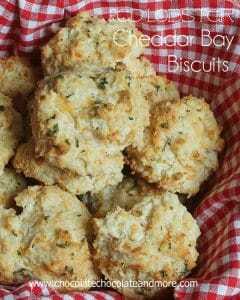 Your biscuits look amazing! We eat a lot of biscuits and pancakes around here. 🙂 I don’t have any shortening in the house…do you think coconut oil would work? I know it would change the flavor but Im not very familiar with baking with coconut oil. Thank you for any advice! I would substitute with butter instead of the coconut oil. If you do use butter, you would need to keep the mix in the refrigerator. Great idea . My Mom used to do the same with pastry for pie shells. Flour , shortening sugar and a pinch of salt . So much better than store bought . In order to use butter without having to refridgerate you simply clarify it.